Our latest Toltoys Star Wars update features the unassuming little green guy above. 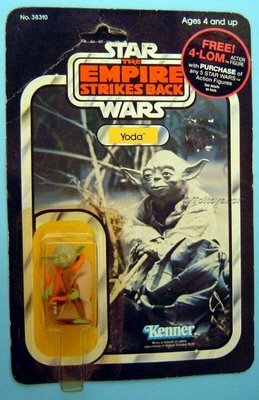 A regular ESB Yoda you say? Computer says No. 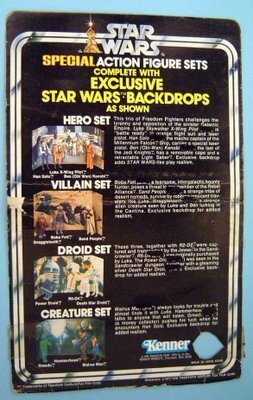 What appears to be a regular Kenner USA release is in fact a rare Toltoys release Survival Kit Offer card, see the reverse shot below. 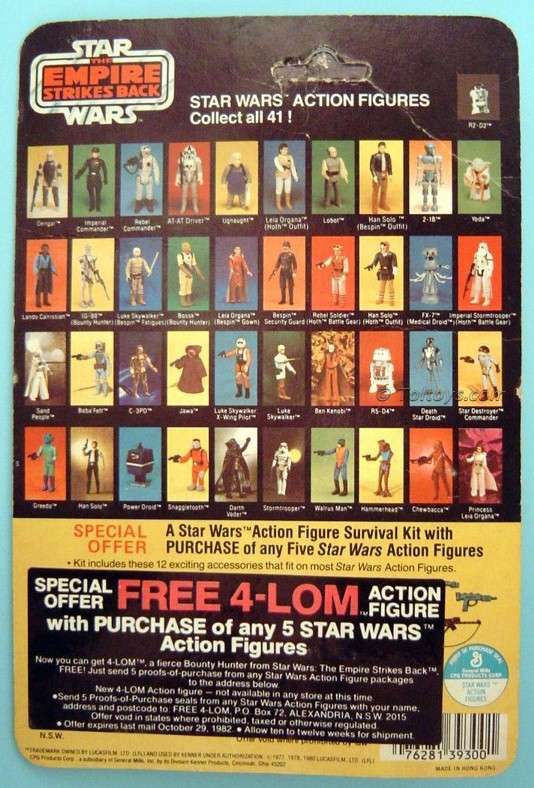 Or at least that’s what it was, until Toltoys updated the offer with the ultra-rare 4 Lom Offer stickers. Yes that’s right, a double Toltoys offer card. Not since the Anakin POTF / Aussie Coin Offer Sticker combo has a Toltoys double act come along, and aren’t we glad it did! Part two of this update features the mysterious “Toltoys NZ upside-down blister” attached to the 9/10th scale card. If I were a northern hemispherian I wouldn’t be able to resist some kind of “Down Under” pun here, but I’m not so I will. These crazy blisters appear to have been affixed to their cards by Ugnaughts, it’s the only possible explanation. 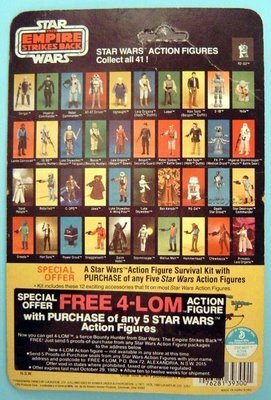 The cards themselves are also slightly smaller than their Kenner counterparts (see the pic below for comparison); again resist the urge for size jokes please. This Hammerhead is only the third carded example I’ve seen, although there are a couple of cardbacks out there too. The supposition of New Zealand origin comes largely from anecdotal evidence, plus anyone whose ever seen an episode of Flight of the Conchords understands it’s no stretch for weird yet strangely entertaining stuff to come out of the Land of the Long White Sheep. Anyone have any of these weird blisters out there? 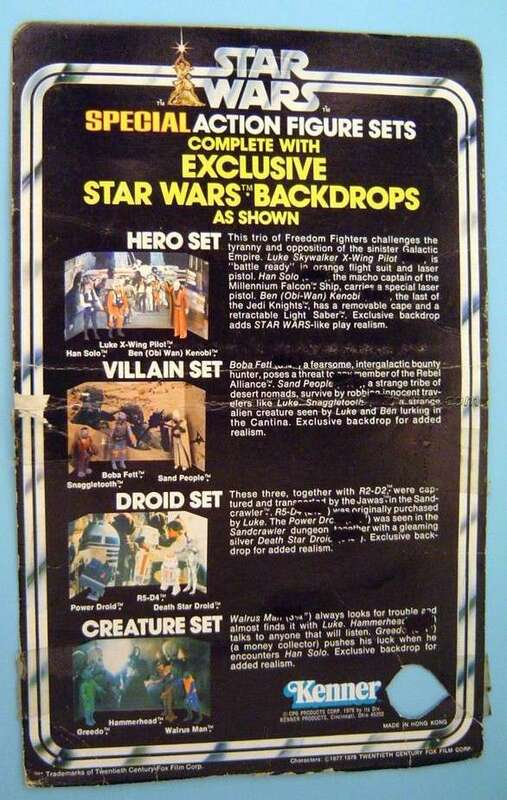 Finally this update we have a Droids 3-pack set. 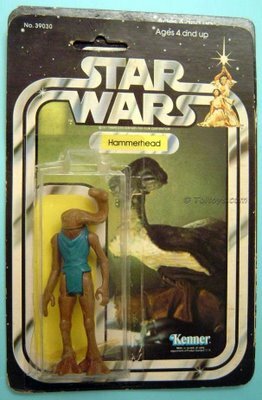 It appears to be a standard Kenner USA release but check the back and you’ll notice all the height measurements have been blacked out. Why? Well for the same reason the Royale with Cheese exists – the metric system. The card was printed with US imperial measurements, not the proper (!) legally approved Australian metrics. While they appear to have been done by hand that seems unlikely, so unless Toltoys employed a thousand 15 year-old work-experience kids for the worst week of their lives I’d suspect (as does the discoverer and owner of this item) that they were created with a template or hastily constructed overprint. It will only take one more example to prove the theory, anyone got one? Huge thanks to Dax for these three incredible items this week, what will his eagle eyes turn up next?